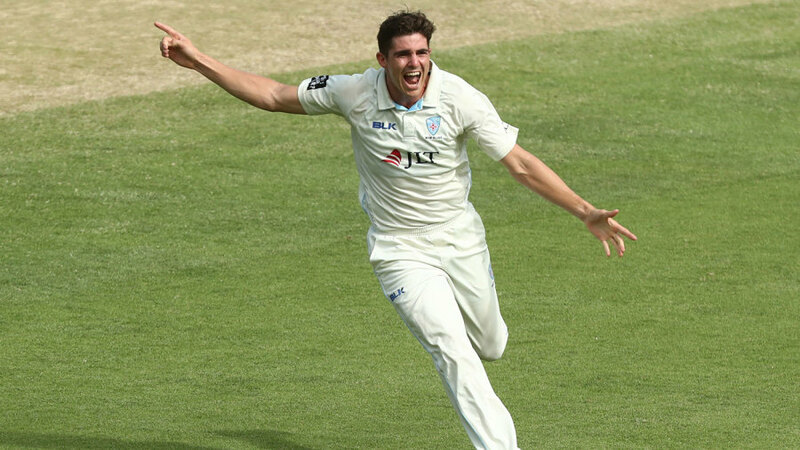 Sean Abbott claimed 5 for 31 and Moises Henriques nipped out three top-six batsmen as New South Wales secured a convincing 174-run win at the Gabba by skittling Queensland for 89. Set 264 in conditions which had been challenging for batsmen throughout, Queensland never threatened to get close to the target after Abbott ripped out the top order with an impressive new-ball spell. With the light fading, New South Wales were told they could only use spin as the overs ticked down, but they were able to avoid having to return on the final day when Jason Sangha had Billy Stanlake caught at slip. Abbott had reduced the the Bulls to 3 for 14 inside six overs. Joe Burns shouldered arms to a delivery that ducked in and took off stump and then two ball later Marnus Labuschagne was given lbw to complete a pair. Charlie Hemphrey became the second batsman dismissed not offering a shot when his pad was clipped by Abbott. New South Wales' charge was momentarily halted by Matt Renshaw and Sam Heazlett but Henriques' introduction quickly put Queensland back in the mire when his second ball climbed and nipped away to take Renshaw's edge. Heazlett was then caught in two minds whether to play or leave a short delivery, lobbing a simple catch to gully, and Nathan McSweeney was caught behind. It was now only a matter of whether the Blues could win in three days. Trent Copeland hastened the end by having Jimmy Peirson caught at third slip and then Abbott returned to complete his haul. New South Wales had fought hard through their second innings in conditions that continued to favour the quicks. Daniel Hughes and Henriques took their overnight stand to 119 with Henriques producing the most dominant batting of the match with his 78 off 116 balls. After resisting the pacemen, it was spin which broke through when Henrqiues edged Labuschagne to slip in his first over. Sangha edged a lifting delivery from Stanlake and Michael Neser ended Hughes' gritty 218-ball stay when, after beating him repeatedly outside off, he had the batsman caught behind. Hughes had reached 40 off 83 balls on the second day, and his next 28 runs took 135 deliveries. Neser was impressive with old and new ball, later having Peter Nevill caught in the gully. However, Jack Edwards produced a valuable hand of 40 as the lower order pushed the lead over 200. It proved more than enough.